the limitless freedom you are. 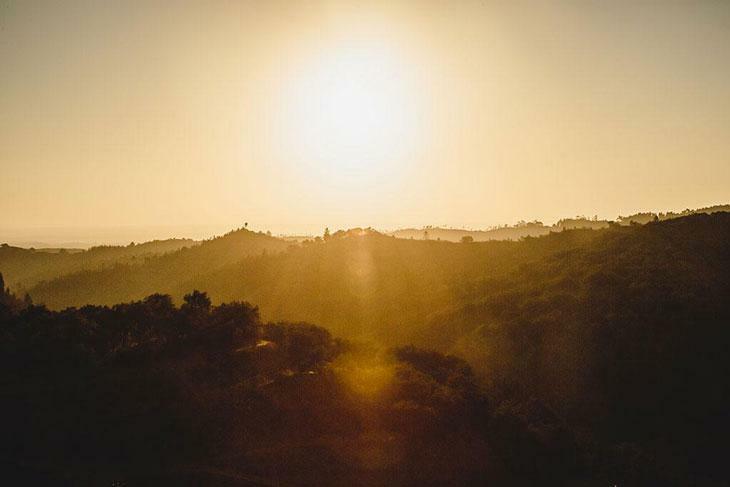 This Silent Retreat is for seekers who are on fire for Awakening. Mooji feels compelled to be in the company of such seeking in order to be in service to ultimate liberation. This 7-day Advanced Retreat is being held at Monte Sahaja, the home and ashram of Moojibaba—an oasis for genuine spiritual introspection where those who are called to recognise and discover their true nature may merge themselves with the spirit of Truth. Being an advanced retreat, it is for those who have previously attended at least one retreat or intensive with Mooji, either physically or online. Satsang takes place twice each day and in this auspicious time Mooji guides, challenges and responds to questions with wisdom, love, humour and searing clarity. The powerful communication that takes place in Satsang permeates the silence that is maintained throughout the 7 days. The retreat also includes one full day for self-contemplation where each one can assimilate the guidance and deepen their experience. The quietude powerfully supports the mind’s return to its very source. Whether you attend physically or participate online, this advanced retreat is an auspicious and potent opportunity to be completely immersed in the energy field of Satsang while in the presence and grace of a great spiritual Master. Welcome! Monte Sahaja is an ashram and retreat center entirely dedicated to the complete realisation of the Self. Situated in the hilly region of Alentejo in southern Portugal, Mooji first came here some years ago with the vision to establish a space that would be a spiritual haven for genuine seekers of Truth. Mooji’s presence pervades and permeates every creative expression on the land and Sahaja’s varied terrain now offers countless beautiful spaces to explore, such as small ponds, hidden paths and vistas, and countless quiet places for meditation and contemplation. Monte Sahaja is an immensely supportive environment for contemplation and introspective self-inquiry and the ideal place for a retreat. Monte Sahaja is very hilly and accommodations are a good 5-10 minute walk away from the central area. There are also many natural earth paths and steps throughout the land which make for lovely scenic walks. One must be reasonably fit to move around at Monte Sahaja, and generally, everyone who stays at Monte Sahaja leaves the land fitter than when they arrive. While Monte Sahaja has many peaceful, shaded contemplative areas, this region is known for its hot and dry summers with temperatures rising as high as 38°C during the day and nights as cool as 10°C. During winter, temperatures can fall below zero. Water is a precious resource in this dry region and we endeavour to save water whenever possible. All toilets are a dry-composting system where the ‘flush’ is a handful of sawdust. They are easy to use and have seats like normal Western toilets. Showers are taken using half a bucket of water (with a scoop) once a day. Showering in this way is a good way of conserving water and is as effective as regular showers. Many participants are used to this method of showering after travelling to countries like India. First-timers adjust quickly to what initially is felt like a novel experience. There are no laundry facilities at Monte Sahaja and no hand washing of clothes is allowed. Ensure that you bring enough clothes to use throughout the retreat bearing in mind that it can be quite hot at this time of year and you may need to change your clothes often. None of the rooms or tent/camper pitches on the land offer electricity or extra facilities. Please do not bring any electronic devices as there are no facilities to charge your personal devices. Access to the Internet will only be available on the first and last day of the retreat. There is strictly no Internet facility during the retreat. This is vitally important to avoid distractions and keep the attention inward. This Advanced Silent Retreat with Moojibaba is for those who are genuinely drawn to Self-discovery. This environment is not for the merely curious, but for those with a sincere and wholehearted commitment to Self-discovery. Please watch these important videos: An Invitation to Freedom and A Simple and Profound Introduction to Self-Inquiry. If you are attending the retreat with a partner or friend, you agree to not communicate with each other during the retreat in any way. Please respect the Satsang of your loved ones and other retreat participants. Silent retreats are not a replacement for any therapy or other medical treatment or diagnosis. If you are currently receiving or have previously received any medical treatment or therapy for issues related to mental health, this silent retreat may not be suitable for you. Therefore, for those with a history of serious mental health conditions, it is not advisable to attend this retreat without ensuring it is reasonably safe to do so. Please check with a specialist healthcare practitioner whether attending the retreat is suitable for you at this time. More information can be found here. By attending this event, you agree to have your image and voice recorded and possibly used for the sharing of Satsang on DVD, mp3 and on the Internet. All recorded material will be used to serve satsang only. Images of all individuals will be treated with the utmost sensitivity and respect. Installation of VLC player App for Android or iOS. You have to see and meet God in this life. Don’t let this life go by and miss discovering the Supreme One. You will find him inside as your constant being. Satsang with Moojibaba takes place twice each day, and may sometimes be offered as a guided Silent Sitting as feels appropriate to the flow of the retreat. There will also be one full day for self-contemplation, which is an immensely valuable and powerful time to deepen in introspection and to truly assimilate the pointings and guidance shared by Moojibaba. No satsangs will be scheduled during this special day as there will be activities to support this marinating in Being. We will move in silence throughout the entire retreat and there will be plenty of opportunities throughout each day for introspection while enjoying the many contemplative areas that are to be found on the land. Other activities during the retreat include morning forest walks, bhajans and laughing yoga, all re-directing the mind to its natural state and source. The schedule is subject to change based on the flow and needs of the retreat. There are two ways to participate in this Advanced Silent Retreat. 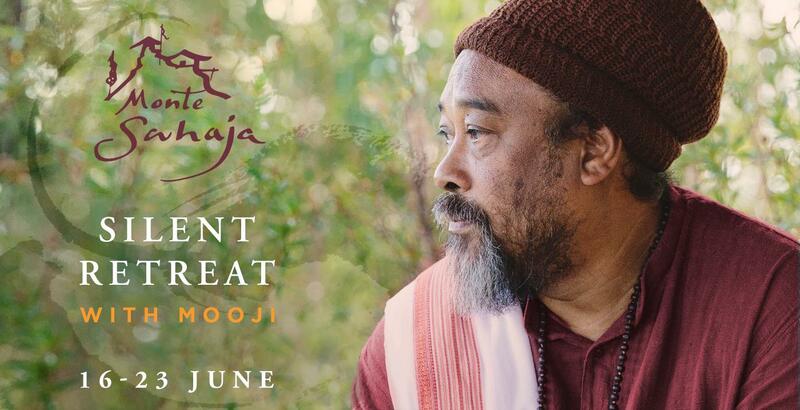 You can come to Monte Sahaja to be in Mooji’s physical presence, or you can join the live Internet broadcast through Mooji.tv. Please note that if you would like to attend physically in Monte Sahaja, you must have previously attended a retreat or intensive with Moojibaba (physically or online) as this event is an Advanced Silent Retreat. Being in the physical presence of a living Master and fully immersing yourself in the energy field of Satsang is a rare and blessed opportunity. Mooji’s loving and unfathomable presence itself can trigger transformation in one who is ripe for awakening. Please be aware that places are limited so we will use a random lottery to allocate spaces. We have found the lottery registration process to be a relaxed and fair process, giving everyone the chance to come to a Sahaja Retreat regardless of Internet speed or capabilities. Information about pricing and how to enter the lottery can be found below. If you are unable to attend physically at Monte Sahaja, joining via live Internet broadcast is an excellent alternative. You will have access to the daily Satsangs in real-time, as well as to any additional scheduled events such as bhajans. For Mooji there is no separation, no distance to those joining online and he sees absolutely no hindrance or disadvantage to your awakening in attending in this way. Registration is via Mooji.tv and more information can be found here. 7-day Advanced Silent Retreat at Monte Sahaja Only those selected by random lottery are able to book a space on the retreat. €550 – €830 EUR depending on accommodation type. Price includes the recordings of the retreat (streaming and downloadable for 6 months). Please do not book your flight before your place at Monte Sahaja is confirmed! Until 25 April you will have the opportunity to enter your name in the lottery which will randomly select who can book to attend physically at Monte Sahaja. If you are selected by the lottery you will receive a confirmation email on 26 April with a link to book and pay for your accommodation. From 27 April-2 May those who are selected by the random lottery need to complete their booking. If you do not book in that time period, your place will be given to the next one on the waiting list (remaining from the random lottery). Please note that we have only limited spaces for single rooms and huts available and that most spaces on this retreat are offered for camping. This works on a first-come, first-served basis. As mind merges in the heart, true understanding awakens. You are the invisible inside the visible, the unmoving inside all movements. Like space moving in space, glowing inside a thin skin called a human being. Prices include the recordings of the retreat (streaming and downloadable for 6 months). Monte Sahaja offers accommodation in various areas, each with their own unique character. You will see and hear names like Himalayas, Kathmandu, Ananda or Saraswati Valley. While most of the available accommodations are tents, there are a limited number of other housing options such as wooden huts and row-house rooms. Each room has been created with loving care and exudes a contemplative atmosphere. They are simple and small yet comfortable and adequate for a meditative life. Huts and camping spaces are widely spread over the land in intimate clusters. Depending on which area you are staying in, the walking distance to the main area can take 5 – 10 minutes. All toilets and showers are shared. There are no attached bathrooms in any accommodation on the land. A walk from your room or tent to the showers and toilets may take a little time. One gets quickly used to this. Monte Sahaja has compost toilets for their natural functioning and recycling efficiency. This also allows us to reduce water wastage. Tent: Tents are provided (Please do not bring bring your own tent). No mattress or bedding included. Please be aware that it is not possible to book your own accommodation outside of Monte Sahaja and join the retreat. All places on the retreat must be booked via Mooji.org after being selected in the random lottery. The retreat fee includes breakfast, lunch and dinner. Only vegetarian meals will be offered for this retreat. Upon registration, you can choose whether you need a gluten free, dairy free or vegan diet. Please note that these are the only special diet options that can be offered for this retreat. We also have a small shop offering a variety of snacks and cold drinks. but make sure this heart is silent and empty. Please do not make any travel arrangements before having registered and receiving confirmation of your booking. Monte Sahaja is in a beautiful, but remote and rural part of Portugal. As there are very limited transport options, we ask that you read the following information carefully. Flying to Portugal You can fly into either Faro or Lisbon airport. We ask that you book your flight to arrive before 12:00 on 16 June and to depart after 18:00 on 23 June. This timing is important because it allows you to catch one of the trains that will be met by our shuttle buses at Funcheira, the train station closest to Monte Sahaja. Train to Monte Sahaja The best way to arrive at Monte Sahaja from Lisbon or Faro is by train. Tickets cost around €16. If you book online at least two weeks in advance, there may be a reduced rate of around €10. Train tickets can be booked online here. From Lisbon: Go to Lisboa-Oriente train station. You can take the metro from the airport to Lisboa-Oriente (3 stops) or a taxi for around €10-12. We will have buses ready to meet certain trains from Faro and Lisbon. Our buses will meet these trains at Funcheira train station. Funcheira is a small and remote rural train station with no facilities and no fixed taxi service. It is located about halfway between Lisbon and Faro. Please consider the train times below when searching for your arrival flight. Arriving by your Own Transportation Please note that parking spaces are very limited in Monte Sahaja, so we ask you not to come in your own car. Being dropped off is okay. There are taxi stands at both Lisbon and Faro airports. From Lisbon Airport to Monte Sahaja will cost approx. €175. From Faro Airport to Monte Sahaja will cost approx. €100. If you do choose to take a taxi to Monte Sahaja please make sure you arrive no later than 17:00 (5pm) on 16 June. At the end of the retreat, we will provide buses from Monte Sahaja back to Lisbon and Faro airports. These buses are free, but you will need to let us know which bus you would like to take when you register. Please consider the following information carefully before booking your return flight. Please note that these are approximate times. We highly recommend that you book flights that leave after 18:00 on 23 June. If you have any questions, please carefully read the Frequently Asked Questions (FAQs) section before writing to ask. This will greatly help the flow as we receive many emails. but as direct and intuitive experience. The fee for attending the Advance Silent Retreat physically is €550 – €830. The fee for online attendance is £110 GBP (Early bird price of £85 GBP until 10 May, 2018). Regardless whether you attend physically or online, this price includes access to the video recordings via Mooji.tv for 6 months (live streaming and downloadable). Is this a residential program? Do you provide accommodation and meals? Those who attend physically in Monte Sahaja will be able to select from a variety of housing options. Most accommodation is in tents, however there are a limited number of dormitory and private rooms. Please see the Accommodation section for more info. Meals are included in this price. Why is there a lottery? Will this event be booked out as quickly as other events? There are a limited number of spaces for this event, and to give everyone a fair chance to come we use a random lottery to allocate spaces. We have found the lottery to be the most fair way to select who is able to book a place on the retreat as it give an equal chance to everyone wishing to come regardless of Internet speed or familiarity using computers. I would like to attend with my partner, but what if only one of us gets chosen by the lottery? If you would like to attend with your partner you can make one joint entry into the lottery system, which, if chosen, means both can come. The lottery form has a section for this option and we require that you only fill in one form; please do not enter twice if you can only come together (eg. for practical reasons). Please note that there are no couple accommodation types for this retreat so if selected you would stay in separate housing. Alternatively, you may make two separate individual entries into the lottery system, but there is no guarantee that you will both be chosen. Satsang with Moojibaba takes place twice each day, and may sometimes be offered as a guided Silent Sitting as feels appropriate to the flow of the retreat. Satsangs vary in length, typically running for 1.5 – 2 hours, and occasionally longer. There will also be one full day for self-contemplation, which is an immensely valuable and powerful time to deepen in introspection and to truly assimilate the pointings and guidance shared by Moojibaba. No satsang will be scheduled during this special day as there will be activities to support this marinating in Being. We will move in silence throughout the entire retreat and there will be plenty of opportunities throughout each day for introspection while enjoying the many contemplative areas that are to be found on the land. Other activities during the retreat include morning forest walks, bhajans and laughing yoga, all re-directing the mind to its natural state and source. The schedule is subject to change based on the flow and needs of the retreat. What is the difference between a Satsang Intensive, a Silent Retreat, and an Advanced Silent Retreat? In a Satsang Intensive, participants arrange their own food and accommodation. Silence is maintained in and around the Satsang venue and is recommended for the duration of the Intensive, but there is the possibility to continue with daily activities if needed. A Silent Retreat is a residential retreat of 7 days with participants eating, sleeping and attending Satsang on site. Silence is maintained throughout the duration of the retreat. Daily activities such as work, reading, dancing, writing etc. are suspended to focus the attention inward. An Advanced Silent Retreat is for those who have previously participated in a Silent Retreat, either physically or online, and are familiar with Moojibaba’s pointings. The structure is similar to a Silent Retreat, however there is usually at least one day of contemplation without any formal satsangs scheduled. Satsang literally means ‘association with the highest Truth’ and also refers to a gathering of people, often in the presence of a teacher or master, who are searching for the highest Truth. Satsang in the form of the Invitation and self-inquiry is a powerful aid to Self-realisation. It is simple, direct and profound. All retreats with Moojibaba are conducted in silence. The maintaining of silence throughout the seven days supports your immersion in the Truth by keeping the attention focused inward. No. We ask you to please refrain from reading, writing, using the internet, drawing, singing or any form of the expressive arts. In other words, drop all outer activities for the duration of the retreat. Moojibaba encourages us to turn our attention inward and make use of the opportunity not to be distracted by any habitual activity. Books written by Mooji and any other books offered in the Sangha Shop are an exception, because they serve the same purpose as the retreat: to immerse us in the energy field of Truth. I have been selected in the random lottery, but am now having trouble with the online registration form or with payment. What should I do? Use a different device (e.g. a computer instead of a phone or tablet). If you cannot resolve the problem, contact events@mooji.org. Your registration is secured when you have received your booking confirmation via email. If you cannot find the confirmation in your mailbox, please check your spam box. If you still see no confirmation please contact events@mooji.org. Can I share my tent or room with my partner or friend? No, it is not possible to share a tent or room. This retreat is a rare opportunity to move alone immersed in your own silence and we highly encourage couples to give each other the space to make the most of this opportunity. Remember, if you are attending the retreat with a partner or friend, you agree to not communicate with each other during the retreat in any way. Please respect the Satsang of your loved ones and other retreat participants. Everyone should bring their own towels. Tent — you must bring all your own bedding and a camping mattress, unless you booked a “Camping Kit” (which includes mat, sleeping bag and pillow). Even in this case, bring extra blankets to make sure you are warm enough at night. Dormitory — you must bring your own sleeping bag (mattress, sheet, pillow, and pillowcase are provided). Private room or Hut — we will provide bedding (mattress, sheet, pillow, and duvet). What clothes or other things should I bring to the retreat? Detailed information on what to bring will be provided once your booking is confirmed. Is there a possibility to do laundry during the retreat? No. Please note that there are no laundry facilities at Monte Sahaja so bring enough clothing for the full retreat. Water is scarce and therefore hand-washing your clothes is not allowed. Do I need to bring any cash with me? Is it possibility change currency or withdraw cash in Monte Sahaja? There is no possibility to change or receive cash in Monte Sahaja. You can change money or use the ATMs at the airport. We have two shops at Monte Sahaja. The One Love Shop sells some handy practical items, as well as drinks and snacks, while the Sangha Shop has a range of books, CDs and other Satsang related items. I read that some of the accommodations at Monte Sahaja are far from the central area. How far is my accommodation from toilet facilities, Satsang space or dining area? The terrain at Monte Sahaja is hilly and the accommodations are a 5-10 minute walk from the Satsang hall and dining area, depending on the type of accommodation. The toilet and shower facilities can be a few minutes walk from the accommodations, but one quickly gets used to this. Monte Sahaja has plenty of chairs with back support available. Yes, some cushions are provided, however we advise you to bring your own cushion if you need extra support. Everyone is required to attend the Welcome and Orientation meeting at 20:00 on 16 June. So we ask everyone to make travel arrangements accordingly. Please email us at events@mooji.org for further instructions. No, unfortunately we are not able to provide such support at present. If you have physical limitations, we suggest you come to one of the other retreats with Moojibaba, such as the one at Zmar this coming September. The retreat will also be broadcast live and you can join online from home. Monte Sahaja is in a hilly rural area, and many areas are only accessible via stairs so unfortunately it is not easily accessible by wheelchair. Is Satsang suitable for someone with a mental health or psychiatric disorder? If you are currently receiving or have previously received any medical treatment or therapy for issues related to mental health, an environment of deep contemplation or introspection (such as a concentrated Satsang environment) may not be suitable for you. Please check with a medical or other mental health clinician whether being in such an environment is suitable for you at this time. When and why might Satsang not be suitable? Those experiencing psychiatric conditions, or other unusually strong emotional upheavals might not benefit from a concentrated Satsang environment. Occasionally, being in such an environment can adversely affect pre-existing mental health conditions. It may bring up latent traumatic imprints or deep-rooted tendencies in the body-mind, which can trigger strong, seemingly overwhelming, thoughts, emotional responses and behaviour. Satsang may offer an opportunity to recognise, release and transcend these states. However, a participant with a mental health condition may feel overwhelmed by this, and so additional medical and psychiatric support may be required. Please be aware that we are not able to provide this type of support or expertise. The questionnaire below is offered to provide more information. This questionnaire is intended as a guide, and does not constitute or replace medical or psychiatric advice. If the answer to any of the questions is ‘yes’, a concentrated Satsang environment may not be suitable for you at this time. Have you ever experienced any unpleasant or unwanted effects (these can include physical, cognitive, emotional or ‘energetic’) that have persisted beyond the duration of your participation in a spiritual practice or retreat, which may have interfered in your well-being and/or functional abilities? Answering ‘yes’ to any of the questions does not necessarily mean you cannot attend Satsang. It requires you to seek specialist advice and receive confirmation from a medical or other professionally registered clinician that your attendance is unlikely to adversely affect your mental health condition. I have been advised or can see from the questionnaire that a concentrated Satsang environment may not be suitable for me at this time. Does this mean Satsang is not for me? Satsang with Mooji works in many subtle ways and the benefit can be felt even if you are not able to be in a concentrated Satsang environment for the time being. Experiencing a mental health or psychiatric condition is not something that excludes anyone from deepening in their Satsang or fully realising their true nature. However, proper medical guidance and treatment as necessary is still very important. The two can support each other. Satsang does not cause mental health or psychiatric disorders. Occasionally, Satsang may bring up latent traumatic imprints or deep-rooted tendencies in the body-mind, which can trigger strong, seemingly overwhelming, thoughts and emotional responses and behaviour. Satsang may offer an opportunity to recognise, release and transcend these states. However, if there is a mental health condition, a participant may feel overwhelmed by the arising of hidden tendencies, and so additional medical and psychiatric support may be required. Please be aware that we are not able to provide this type of support or expertise. Please refer to the questionnaire above for more information. For any queries you may contact events@mooji.org. The weather in Portugal is very changeable. It is best to bring layers so you are prepared for all kinds of weather. June can be very hot, but it can also be quite cold, especially at night and in the early morning. You can check the weather for Ourique (a nearby town) here. If you are camping we highly recommend that you bring a good sleeping bag for low temperatures. For some countries a visa is required before entering Europe. You will need to check with the Embassy or a travel agency in your own country about the necessary visa requirements before your departure dates. This information is also easily found on the Internet (http://www.schengenvisainfo.com/who-needs-schengen-visa/). Make sure your passport is valid for at least six months beyond the completion of your trip or you may not be allowed to travel. We will not offer wifi or Internet access during the retreat, and there are no Internet facilities nearby. You are highly encouraged to not use the Internet during the retreat and to switch off your mobile device completely. This is out of respect for your Satsang and for the Satsang of all the participants. If you cancel up to 31 days before the event you will receive an 75% refund. The above days are calendar days, not including the day on which the event starts. Please note that tickets are non-transferable, and as such it is not possible to sell, give or otherwise transfer your ticket to another person. If you have any further questions that remain unanswered, please contact events@mooji.org. resting place for all beings.